Centre Européen d’Études Japonaises d’Alsace (CEEJA), nestled in the idyllic Alsatian landscape, has been a friend and collaborative partner for the Sainsbury Institute for many years. CEEJA, established in 2001, is an active research community with the mission of furthering Franco-Japanese relations. They have a strong partnership link with the Department of Japanese Studies at the University of Strasbourg and works with many other universities in Europe and Japan to bring together experts from Japan and all over Europe. Simon Kaner, Head of the Centre for Archaeology and Heritage at the Institute, has been instrumental in developing Sainsbury Institute-CEEJA relationship. Simon is always mindful that working with Japan is all about ‘long-term investment’. He first visited CEEJA for the French Association of Japanese Studies conference in the beautiful town of Colmar back in 2003. 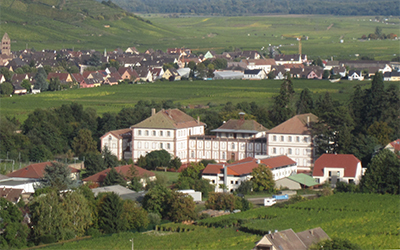 As an example of the collaboration between the Institute and CEEJA, let us consider the joint workshops on the archaeology of rivers and religion held in Alsace in December 2011. These workshops are an excellent example of how long-term planning can deliver unanticipated results. Simon originally discussed the possibility of doing something on Japanese archaeology with CEEJA back in the early noughties when Andre Klein of CEEJA visited Norwich (Simon still remembers being impressed by Monsieur Klein’s determination to take cheese bought at the Cheeseman stall in Norwich market back to Alsace). A year or so later, Simon took our then Handa Japanese Archaeology Fellow, Ishikawa Takeshi, to Alsace to further progress discussions – and Monsieur Klein hosted a wonderful lunch with Alsace Departmental archaeologist Olivier Kayser. On this occasion, Simon was amused by Ishikawa-san’s apparent bemusement at being offered exits to three different countries (France, Germany and Switzerland) from a single airport (Basel’s Europort) – a truly novel experience for a Japanese archaeologist. It took some time, but eventually, in December 2011, we finally realised two workshops relating to Japanese archaeology with CEEJA. Thanks to the ever resourceful Monsieur Kayser, we were able to hold the first workshop, on the archaeology of river valleys, in Strasbourg, in the historic part of the Alsace Departmental offices, which when constructed were known as the Kaiser Palace on the Platz der Kaiser: all this took some further explanation for our Japanese guests who were less accustomed to the movement of national boundaries than our Alsatian colleagues. The theme of the first day was the archaeology of the Shinano and Chikuma River drainage, and we were helped in our deliberations by archaeologists who were working along the length of the Rhine – necessitating collaboration between archaeologists in the Netherlands, Germany, France and Switzerland, conversing in several different languages – something of an object lesson for our Japanese colleagues working across just two prefectures in Japan,, Niigata and Nagano. The results of our researches along the Shinano-Chikuma drainage will hopefully be published in 2017. 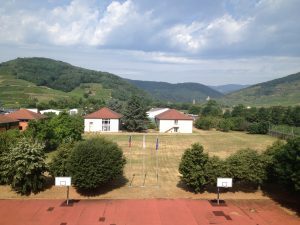 The second day of the conference was held at the CEEJA headquarters: a converted nunnery amid the vineyards of the rolling Alsatian countryside, which had subsequently been used as a Japanese high school, and was only latterly converted for CEEJAs use. We were joined on both days by a contingent of Japanese archaeologists from Kokugakuin University in Tokyo, one of the Institute’s major research partners in regard to archaeology and cultural heritage, led by Professor Kobayashi Tatsuo, Senior Advisor to the Sainsbury Institute on archaeology. Also in the group was Professor Yoshida Eiji, a renowned specialist on Chinese archaeology and the archaeology of ritual sites. He gave a memorable presentation on sacred Shinto sites, including Okinoshima, which is shortly to be put forward for UNESCO World Heritage status by the Japanese government. Very sadly, Professor Yoshida passed away in 2014 – and we will be dedicating the work we are involved in on the archaeology of Okinoshima to his memory. With these two workshops, CEEJA provided the opportunity for the Sainsbury Institute to introduce some new aspects of Japanese and continental European archaeology to each other. We are very grateful to all involved at CEEJA, the Marc Bloch University in Strasbourg, the Alsace Departmental archaeologists, members of the Institute’s Shinano-Chikuma River project and Kokugakuin University in Tokyo for creating some truly wonderful memories of Christmas markets and other aspects of Alsace life. Looking to the future, CEEJA is refurbishing its existing library to create the new Japan Study and Research Library. Scheduled to open in the middle of 2016, the Library will include some 100,000 academic books and numerous periodicals, mostly in Japanese, but also in English, French and German. These holdings have been privately collected by Mr. Erich Pauer (formerly University of Marburg, Germany) and his spouse Mrs. Regine Mathias-Pauer (University of Bochum, Germany) over the last decades. Emphasis has been laid on collections on history (pre-modern, modern, history of society, gender studies, history of economy, industry and technology) and contemporary sociological studies including social and cultural anthropology, but also economics, business, law, art, and – to a lesser degree – education, literature and language. The collection also comprises books, journals and scholarly materials donated by Japanese scholars from various disciplines and by various Japanese academic institutions. Thus their library holdings cover a broad range of topics. There are also numerous journals In the respective fields to be made available. Furthermore, new approaches in the humanities, including the so-called “iconic turn”, have offered reassessment opportunities of pictorial representations as an important source of scientific research. In response to this, another part of the new library will house a comprehensive media collection, which includes a collection of Japanese movies (DVDs) and many recordings of various Japan-related television programmes, an extensive collection of colour slides, a collection of various historical documents (largely pre-Second World War, often handwritten), historical photographs, picture postcards, city maps, atlases, political posters, coins, historical company shares and bonds as well as artistic prints and oil paintings of Japanese modern artists, etc. With the acquisition of these holdings, books, journals, archival materials and media-collections, CEEJA’s existing facilities will be expanded to create a cross-national, Japan-related research, study and documentation centre. The library will become an integral part of and support for the many activities already undertaken at CEEJA. It also offers great potential for research scholars and students engaged in various fields of Japanese studies not only from France and the neighbouring regions of southern Germany and Switzerland, but also from Europe and beyond. The library is open to students, scientists, scholars and individuals interested in Japanese matters. Many at the Sainsbury Institute look forward to a continued relationship with CEEJA and to visit the new Japan Study and Research Library, and hope that many of our readers will also take the opportunities to explore the gem of Alsace on their next visit there.